Knee joint anatomy involves looking at each of the different structures in and around the knee. The knee joint is the largest and one of the most complex joints in the human body. There are various muscles that control movement, ligaments that give stability, special cartilage to absorb pressure and various other structures to ensure smooth, pain-free movement. Knee pain is a common problem that affects people at all ages. Many different things can go wrong with the knee. If we understand a little about knee anatomy, how everything should work and how the different structures fit together, we can make sure we do the right things to ensure a full recovery, prevent injuries and stop problems coming back. The knee is a synovial joint which means it has a joint capsule which is like a sac surrounding the joint. The capsule contains synovial fluid which nourishes and lubricates the joint allowing it to move smoothly and painlessly - a bit like the oil in your car. Here we will look at all the different structures that are part of knee joint anatomy, how they work and how they fit together. The most basic component of knee joint anatomy are the bones which provide the structure to the knee. There are four bones that make up the different knee joints: the tibia (shin bone), femur (thigh bone), patella (kneecap) and fibula (on the outer side of the shin). They support the body and transfer forces between the hip and foot, allowing the leg to move smoothly and efficiently. The human knee actually comprises of two joints, the tibiofemoral joint (thigh and shin bones) and patellofemoral joint (kneecap and thigh bone). It is a hinge joint which means it can bend, straighten and twist. You can find out all about the different bones and joints that make up the knee, how they function and what can go wrong in the knee bones section. b) Meniscus: which is a special extra layer of thick cartilage. These acts as shock absorbers to reduce the forces going through the bones and reduce friction, allowing the bones to move smoothly. 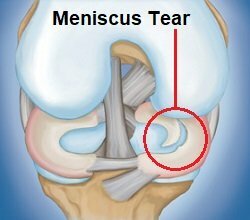 Meniscus tears are commonly associated with twisting knee injuries and arthritis and can cause pain, locking (knee gets stuck) and swelling. You can find out all about the different types of knee cartilage, how they work, and cartilage injuries and how to treat them in the knee cartilage section. So what about knee muscle anatomy? 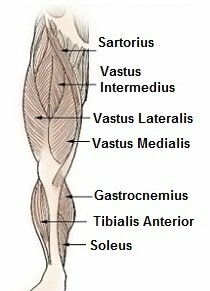 The main muscles controlling the leg are the quadriceps, four muscles on the front of the thigh which straighten the knee, and the hamstrings, three muscles on the back of the thigh which bend the knee. The glutes (buttock muscles) are also very important in controlling the position of the knee and how the forces transfer through the joint. Weakness and tightness in the leg muscles are common causes of knee pain. By stretching and strengthening the knee muscles, you can reduce the forces going through the joint, reducing pain and swelling, and improving function. You can find out all about the different muscles in knee joint anatomy, how they work, how they can get damaged and how to strengthen and stretch them in the knee muscles section. 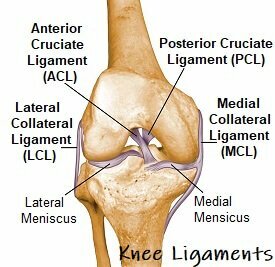 Let's move on to look at knee ligament anatomy. Ligaments are tough, fibrous connective tissues which link bone to bone, made of collagen. In knee joint anatomy, they are the main stabilising structures of the knee (ACL, PCL, MCL and LCL) preventing excessive movements and instability. 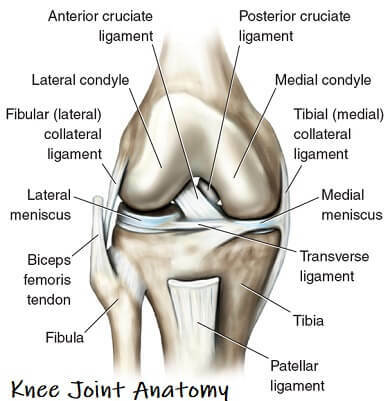 There are two sets of ligaments in the knee, the cruciate ligaments (anterior and posterior) which sit inside the middle of the joint, and the collateral ligaments (medial and lateral) that are found either side of the joint. The most common ligament injuries are ACL tears, MCL tears, PCL tears and knee sprains which occur when the ligaments are overstretched. In the knee ligaments section we look at each of the different ligament in-depth including how they work, what their role is, how they get damaged and how to make the best recovery from ligament injuries. Tendons are often overlooked as part of knee joint anatomy. They are they soft tissues found at the end of muscles which link the muscle to bone. The main tendon found at the knee is the patellar tendon which links the quads muscles to the shin bone. 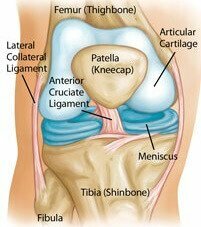 The knee cap actually sits inside the patellar tendon. Tendons are frequently damaged by overuse or excessive stretching resulting in tendonitis. The most common knee tendonitis problem is patellar tendonitis (aka Jumpers Knee) at the front of the knee. 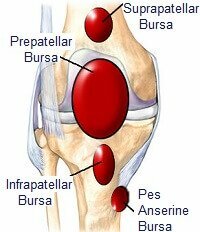 Now let's have a look at knee bursa anatomy. Bursa are small fluid filled sacs that reduce the friction between the bones and soft tissues to prevent inflammation. There are approximately fourteen bursa around the knee. If there is excessive friction on the bursa, usually due to muscle weakness, tightness or repetitive pressure, then the bursa gets inflamed, known as knee bursitis. In the knee bursa section we look at each of the bursa, where they are, what they do, how they get injured and how to make a full recover from bursitis. Another important part of knee anatomy is the joint capsule. This is like a bag that surrounds the joint containing synovial fluid to nourish and lubricate the knee allowing it to move smoothly and freely. Any swelling that occurs in the joint is contained inside the capsule, which is why injuries can cause the knee to "balloon". If the joint capsule is damaged, swelling is no longer confined to the joint so tends to actually be less obvious. You can find out more in the knee swelling section. When looking at the anterior aspect of knee joint anatomy, you will find the patella (kneecap). This is a small, triangular bone which sits in the quadriceps muscle at the front of the knee. The patella is lined with cartilage which is actually the thickest cartilage in the whole body due to the massive forces that go through it e.g. the force going through the kneecap when coming downstairs is 3.5x body weight. Knee cap pain is one of the most common problems associated with the knee. To learn more about the different elements in knee joint anatomy, use the links above. Lots of things can go wrong with the different aspects of knee anatomy, causing pain. To find out more, check out the sections on knee injuries and common problems. Alternatively, if you have a knee problem and want help working out what is wrong, visit the diagnosis section. Find out more in-depth information about knee joint anatomy by choosing from the following links: muscles, bones, cartilage/meniscus, ligaments and bursa.